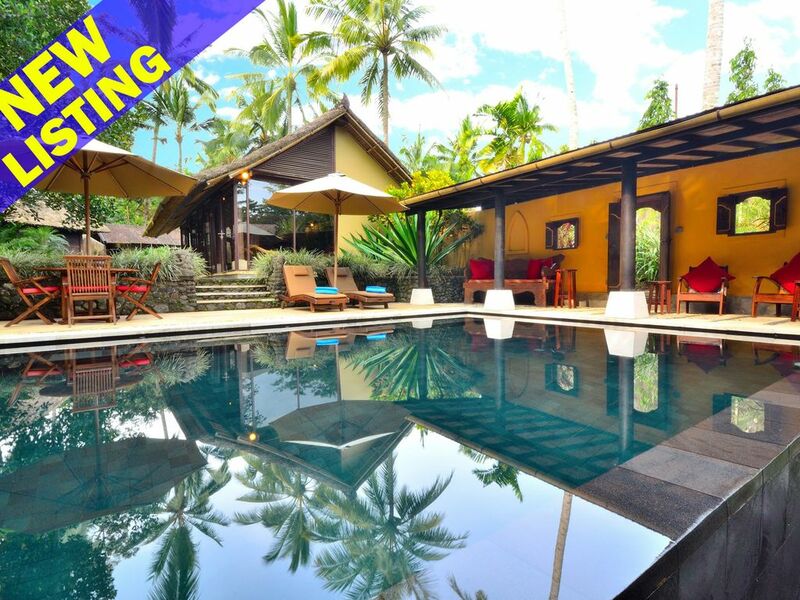 A unique private villa in the foothills near Ubud that delivers you from the tourist throng and offers you a window onto an ancient culture. This is a special place for those who love artistry, value authenticity and seek serenity with style. This generous space offers a grand day bed dressed in regal fabrics, relaxing chairs, an elegant Javan-colonial dining room and French doors that look over the jungle gorge and dramatic black-stone, wet-edge pool. This beautiful, elevated bale is the perfect place to meditate, do yoga, read, paint or draw. For those seeking modern forms of entertainment, there is a flat screen TV with surround sound and DVD/CD, with Indovision cable TV housed discreetly within an antique Java cabinet. This is a dream space like no other. Looking out the stunning glass wall to the moon as it hovers languidly, whilst fireflies dance in the forest before you. Inspired by the traditional Balinese rice barn, over three levels Offers a living room, undercover deck with day bed, largely enclosed bathroom opening onto the deck and upstairs is a romantic bedroom and loft on the third level. Whether you are dining beside the black volcano stone pool with its wet/infinity edge, reclining on the wonderful day bed cosseted by comforting cushions or relaxing in the armchairs made from upcycled former Balinese fishing boats, there is a space and place for you poolside. There is even a hammock strung between a circle of palm trees to settle into and read and relax.